Harry Arter: "Declan seems very old school in his beliefs and his upbringing." Harry Arter said the Republic of Ireland squad are completely behind Declan Rice as the West Ham United teenager continues to mull over his international future. The 19-year-old, eligible for both the Republic of Ireland and England, told The Times today that choosing his international path is "one of the hardest decisions I will have to make in my career". It's a decision he has still not made. Despite playing three times for the Ireland seniors, all of those games were friendlies so Rice can switch allegiances to the country of his birth. England are keen, and it's resulted in a very public tug of war. "Declan's a young lad," the Cardiff midfielder told RTÉ 2fm's Game On. "He's someone I've only spent one squad with, but what I'll say is that he's a lovely boy, someone who wants to be the best player he can possibly be and players that have dual nationality it is a tough decision to make. "The manager has given him the full respect of leaving him out of the squad, supporting him throughout the whole thing, and I know as a squad we're doing the same. "He's a top player, someone who will reach as high as he wants in my opinion. His attitude and work ethic is unbelievable. You see so many young players nowadays with all the ability but who probably don't realise what it takes to get to the top. "Declan seems very old school in his beliefs and his upbringing. If he does pick England it will be a massive loss to us, there's no denying that. But as I say it is difficult for players when they have two countries they have string feelings for. "As I say I know as a squad we've supported him and as a mate I'll be supporting him." 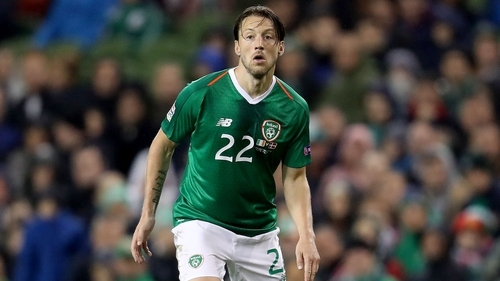 Arter found himself in the middle of another controversy when a fallout with assistant manger Roy Keane led to him stepping away from Ireland. "As a squad we've got more important things to focus on. I just want to try and start performing when selected. That's probably been my biggest disappointment throughout my time with Ireland. I don't feel I've performed anywhere near as well as I could have. "There's no excuses really. I have to take responsibility for not bringing my club football to the international stage. There's no beating around the bush about it. "I made a massive change in my life with the move to Cardiff. I don't want to go into the situation too much. I've said what I needed to say about it. At the time I just felt it was the best decision to make for myself and the team."